Location: Hoyt, CO to Last Chance, CO.
Summary: Day 3 of great setups in NE Colorado and a MOD risk to boot. I started out heading toward Fort Morgan and then up toward Sydney, NE. Storms ironically began to fire near Denver and on the Palmer Divide. I did an about face and ran into Verne Carlson along the way. I stopped at Mark Farniks house near New Raymer and decided to wait it out for a while with him and Zach Young. Another storm blew up toward the north so it became a question of which one to chase. The better overall dynamics were south, so off I went followed shortly by Mark and Zach. 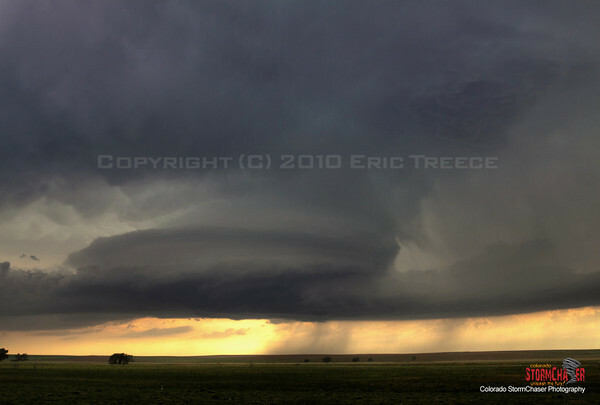 I intercepted a TOR warned cell near Hoyt, CO. V2 was all over this and it was a chaser circus with DOW’s and research vehicles all over the place. I stopped and shot time lapse of this storm while eyeing another storm that formed near Franktown, CO and was tracking ENE. You could see the base of that storm all the way from where I was in Hoyt. I chased the Hoyt storm for some time but it never really could get surface based and keeping my eye to the south, watched the Elbert County storm with great interest. Apparently I was not the only one. The massive convoy of V2 and the plethora of other chasers were twisting and winding their way south on the back roads. I picked one road that nobody else was taking (Basically a two track) that I knew would take me out of the circus and straight to Hwy 36. After I got to 36, I headed to a point about 6 miles West of Last Chance and set up for some time lapse. This was simply a BEAUTIFUL storm. It was TOR warned, but there was no surface based action, similar to the Hoyt storm. I called NWS Boulder and informed them that I had the storm on my ChaserTV stream if they wanted to check it out. After about 15 minutes suddenly there was some surface based convection taking place and out of the blue a gorgeous LP storm dropped a tornado right there. It was every chasers dream! This tornado lasted about 6 minutes. I started to head east on 36 to stay ahead of the storm after the 1st tornado dissipated. I made it about 2 miles when I looked over my shoulder and there was another tornado already well developed on the ground to my west. I stopped and set up shop to film this tornado. Again it lasted just over 5 minutes. A new meso was forming in the field to my immediate SW and I was in absolutely PERFECT position for the next tornado if it formed. And it never did. The show was over tornado wise, but the structure show lasted a good hour after that. I did more timelapse video near Lindon, CO as well. The video I shot was featured on the Weather Channel later that night. What an absolutely great chase day in Eastern CO.